The Big Jump Project is a national, three-year, and wide-reaching community development initiative. Through targeted investment in a neighborhood’s streets, the project will improve mobility options and access to jobs, education, and recreation. The result will be stronger neighborhoods that are better places to live, work, and play. In the autumn of 2016, a national non-profit called PeopleForBikes announced the Big Jump Project, and invited cities from around the country to apply. Nearly 100 cities answered the call, and only 10 were selected. Along with the likes of New York, Los Angeles, Portland, and Austin, Memphis was one of the lucky ten. Between now and early 2020, these ten cities will achieve great things. Each city was asked to select a focus area, and the City of Memphis chose the general area of South Memphis. Each city was also given the flexibility to make the Big Jump it’s own. While originally conceived as a “bicycling” project, the City of Memphis chose to expand the scope to walking, bicycling, and traffic calming. In short, Memphis wants to use the Big Jump to deliver safer streets for all users in the focus area. What will the Big Jump do? Safer Streets for Walking, Bicycling, and Driving: Multiple streets in the focus area will be re-surfaced and re-designed to improve the safety of all users and improve access to jobs, education, and recreation. Development of a Safe Streets Network: Planning for the network will kick-off with public workshops in the fall of 2018. Safer streets will forge new connections between residents and parks, public spaces, and community destinations. Community Programming: Efforts like the Big Jump Teen Ambassadors and South Memphis Glide Rides are bringing South Memphis residents together, providing free social activities in the neighborhood, strengthening a sense of place, and showcasing the community’s assets. 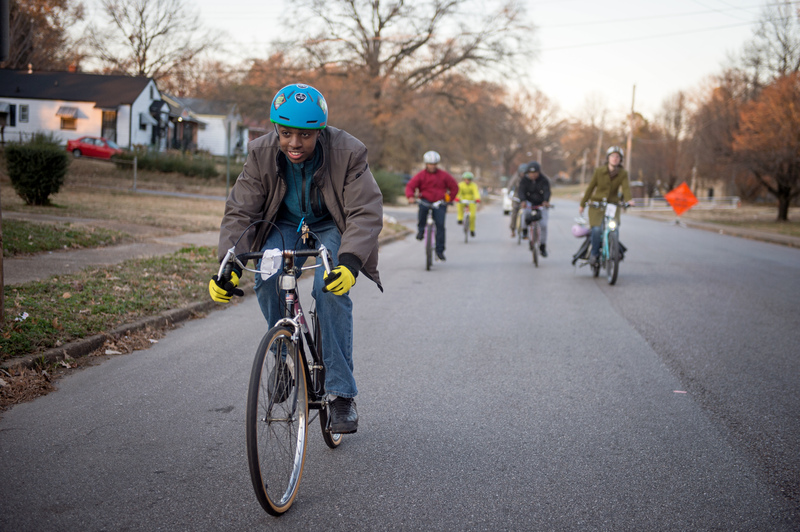 Stronger Local Businesses and Non-Profits: The Big Jump will work with small businesses and non-profits already on the ground in South Memphis to find ways that bicycling can support their operations or mission. For example, cargo bicycles can act as low-cost delivery vehicles or serve as mobile food vending platforms. 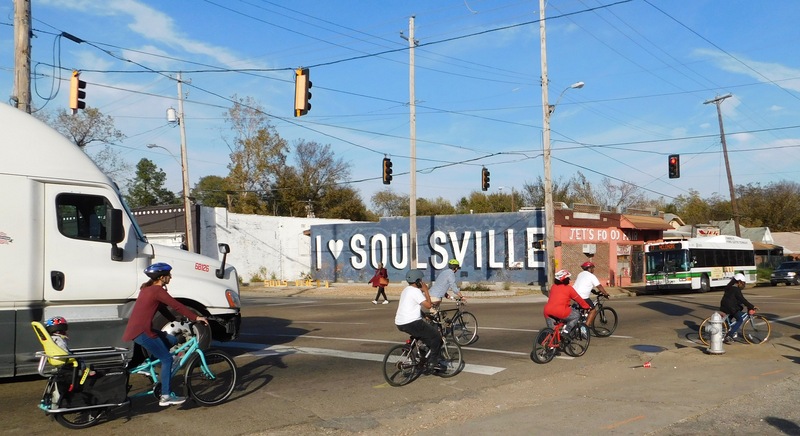 National Media Focus: Over the life of the three-year project, Memphis – and South Memphis in particular – will receive widespread recognition as a leader and innovative community. Among transportation practitioners, policy makers, and advocates, all eyes are on the Big Jump. In fact, a feature documentary following the progress of each of the Big Jump cities is already in production. How much is the Big Jump worth? Taking into account the committed funding from all sources — People For Bikes, City of Memphis, State of Tennessee, private donations, etc. – the Big Jump has already targeted $2.3 million toward South Memphis as of July 2018. That total will continue to increase as components of the effort progress, and additional fundraising advances. Who is managing the project locally? The City of Memphis’ Bikeway & Pedestrian Program Manager, Nicholas Oyler, is the lead contact for the project. An advisory committee consisting of neighborhood stakeholders and partnering organizations has been established to guide the project. What is the project’s local target area? Diverse demographics that are well-aligned with PeopleForBike’s stated ambitions with target communities. The opportunity presented by the economically depressed neighborhoods of South Memphis to demonstrate how active transportation can improve access to jobs and education, and increase safety in the neighborhood through increased activity and reductions in serious crashes. 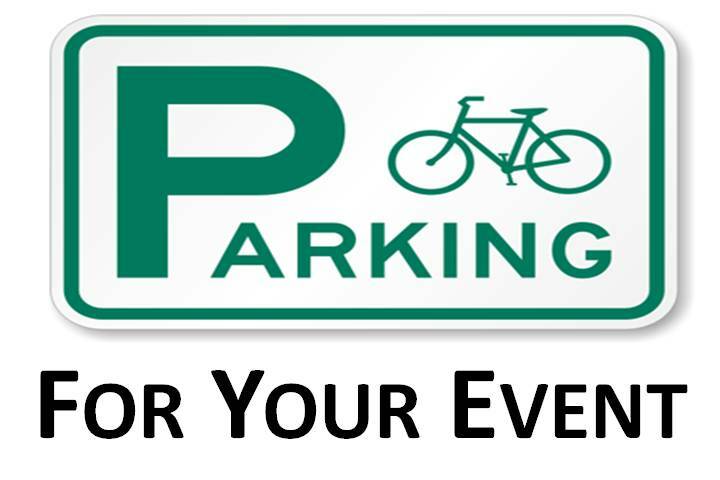 The opportunity presented by the economically surging neighborhoods of South Downtown to demonstrate how active transportation can be a convenient alternative to driving a car, reduce traffic congestion, and decrease real estate development costs by reducing demand for car parking. Potential synergy with impending new or improved public transit services or facilities. 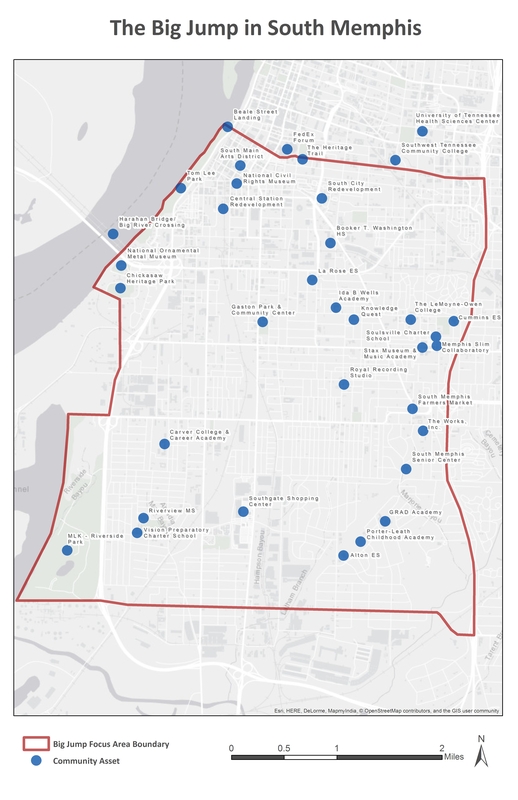 A growing network of safer streets and facilities: South Memphis Greenline, the Harahan Bridge, Main-to-Main, the Heritage Trail, protected bike lanes on Crump Blvd. and Danny Thomas Blvd., South Parkway bike lanes, etc. Multiple community revitalization efforts already underway: Soulsville, South City, Central Station redevelopment, etc.